It?s once again that time of year that we here at the Michigan Auto Racing Fan Club wish each and every one of its members a Happy & Joyous Holiday Season. I hope everyone gets everything on his or her Christmas list. May all of you stay safe and return for the 2002-racing Season. 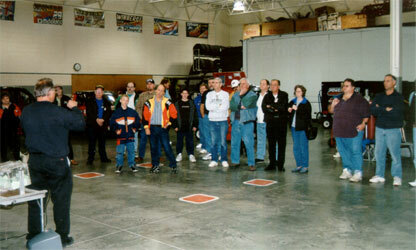 After the season had ended for the Craftsman Truck Series, Bob Keselowski agreed to host our November Meeting. Members received a first hand look at the shop and all the equipment necessary to make it all work. There were trucks in various stages of preparation/repair, from new chassis’ fresh from the fabricator hanging from the ceiling, to one that may be sent to the scrap heap after an altercation with the wall. In typical Bob Keselowski manner, it took a little bit to get him talking, but once we did, we were offered a wealth of knowledge, ranging from possible rule changes for 2002 and how NASCAR’s change in televising races has affected acquiring sponsorship to how well his sons fare behind the wheel of their rides. Curiosity got the best of some. 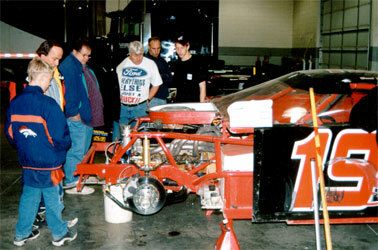 Even during our meeting, young Brian Keselowski continued to wrench on his late model in preparation for the 2002 season. 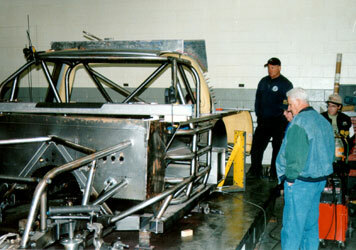 Bill Stone takes a closer look at a brand spankin new K Auto truck chassis, that’s Ron Keselowski in the back ground. Special thanks to Cathie Rohloff, Cory Russell, and Bill Palmer for donations to make this quilt. As the Holiday season is coming upon us and banquet season approaches we must stop and say thank you to all who donated their time and racing facilities in support of the Michigan Auto Racing Fan Club. With out your continuous support we would not be able to have our membership grow. As our club continues to grow we look forward to a long and lasting relationship with all of our membership tracks and supporters. November is the month for giving thanks and we give thanks once again to all of you. P.S. Our thoughts and prayers go out to the family of Steve Crowe, sports writer for the Detroit News/Free Press. 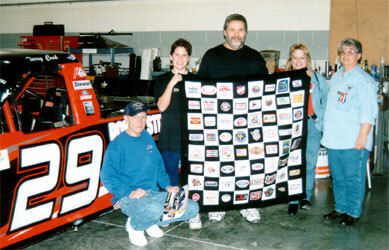 Steve was a great supporter of our club as well as auto racing. He not only wrote about the big race venues but the local fans and small town racers. Steve passed away last month and will be missed by many here at MARFC. 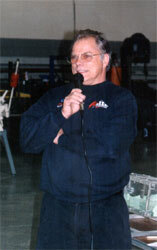 Steve was awarded our MARFC Motorsports Writer of the Year Award just a few years back at our annual banquet. May our memories of Steve live on for the years to come. Our October Meeting featured guest speakers Tommy Cameron, PR Director for Michigan International Speedway, Dennis Strickland, 2001 Toledo Speedway Champ and Allen Chevrolet/Cadillac-Cintas Challenge, and Bob Capps of Kart2Kart. We also drew the tickets for our annual cheer raffle and just like our last visit to Kart 2Kart, we had a whale of a time on the karts after the meeting. 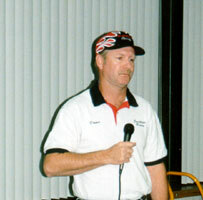 Tommy Cameron Explained all the changes coming to MIS for the 2002 season and beyond. Wishing CART Good Luck in their future and welcoming the IRL to Michigan. Changes at MIS for 2002 include Moving the June Winston Cup Race weekend back to Father’s Day as it had been in the past. IRL replacing the CART race in August with a Craftsman Truck race on Saturday. Special pricing for the IRL/Craftsman Truck event. The IROC race will not be held at Michigan in 2002 because of schedule changes and difficulties in getting drivers from their points race location to MIS. And last but not least, auto racing is being affected by the tragic events of September 11, 2001 as well. Like many other tracks have already implemented, MIS will be adding additional security and strictly enforcing new rules concerning coolers, large bags and backpacks. Visit the MIS website or contact them for more details concerning schedules, pricing and cooler policies. 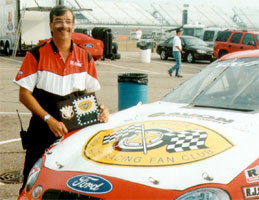 Dennis Strickland looked back at his 2001 Season and how he got started in stock car racing. 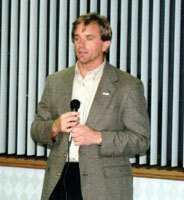 Dennis Strickland could not have hoped for much more in 2001. Toledo Speedway Champion and Champion of the 2001 Allen Chevrolet/Cadillac-Cintas Challenge, an honor comprised of points earned at Flat Rock and Toledo Speedway. Oddly enough Dennis’ racing began with a street car. He thanked his wife Tina for her support and for helping to keep him in check during a race. He explained his crew played a huge part as well in his success, using only one care for both Toledo and Flat Rock requires a huge amount of dedication to make necessary changes to be competitive. 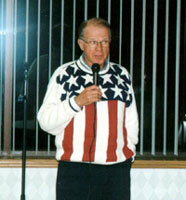 Bob Capps spoke about the upcoming Robbie Buhl Racing for Kids Banquet being hosted at Kart2Kart on November 29, 2001. The event will include Dinner and Kart racing for a Donation of $50. There will also be a silent auction held for numerous Racing related items. Americans have risen to the cause and aided those who are in need. We here at MARFC put a challenge to all of it’s members and all racing fans across the country to remember those who have died in this tragedy and to help in any way we can. May God Bless and keep the families and friends of those who lost loved ones and May God Bless all of us and guide us to acquire peace across the world. 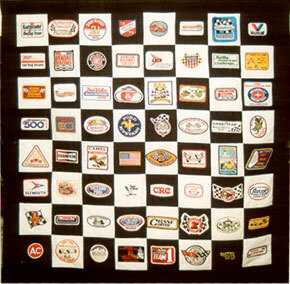 A hand made quilt featuring racing patches, including early MARFC patches, Indianapolis, and many others. The quilt is being raffled off to benefit the Annual Children’s Christmas party. E-mail your president, Wild Bill, at president@marfc.org for more details. Special thanks to Cathie Roloff, Cory Russell, and Bill Palmer for their donations to make this quilt. Many of our members have e-mail addresses and we would like to try and cut our costs on monthly postage. If you all could send me your e-mail address even if I all ready have it on file or if you have a new address please contact me with it. If we could get most of you to accept just the e-mail version of the MARFC MESSENGER each month if would save us dollars in the long run. But, If you wish to still receive both please let me know ASAP. Please be sure to contact me if you change your e-mail address or home address so either one can make it to you each month. By the way yearly renewals are coming up in December so renew your membership early. Thanks and as always keep racing. P.S. 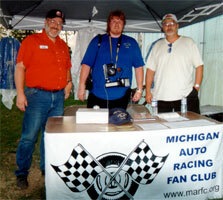 Just an update on club member and ARCA Official Dennis Schalm who was in the hospital last month for chest pains. Dennis is home as wishes to send many thanks to all who sent him best wishes for a speedy recovery. Awesome Sprint car racing is the best way to describe the Merritt Speedway. Great dirt track racing in all the divisions. John Taylor, driver of the Michigan Modified # 3 was given the MARFC/Helmet & Uniform Bag because of his hard luck the week before, rolling his car five times, but was back in action the following week. Special thanks to Ed & Carmen VanDuinen and their entire staff for letting our members be apart of a great night of racing. Club volunteers for the night were Herman Bratfish, Laura & Jimmy Tucker. Sorry, no photo available at this time. One thing for certain, our first member track in the Upper Penunsula sure showed us grand time on our first Fan Club Night at Kinross. We are excited to have enjoyed a great member turn out at a very young race track. Kudos to Tom Maxwell for putting on a GREAT show. Among the members filing through the front gate at Kinross were Mark and Darcie Fuzi. Darcie is a columnist for the Mid-American Racing News. It is sometimes amazing to see just how far people will travel to see short track racing. All the way from the Detroit area were Walt Moore(l), MARFC Vice-President, Bob Michon(m), and new member, Michael Davis(r). Also peresent were members from the Flint, Owosso, and Mt. Pleasant areas. Fans were treated to a fantastic day of Winston Cup and Busch Series practice. Thanks to Tommy Cameron for again offering MARFC Members the opportunity to visit the MIS facility. At MIS, during the August ARCA race, Dennis Schalm was finally caught and presented with his Appreciation Award for his time and effort in supplying the decal which appears on the hood of Roger Blackstock’s ARCA Ford Taurus.